NBA 2K11 will ship a 3D-enabled version for PS3 beginning Nov. 16, and a free patch enabling 3D presentation for all versions will go live in January, 2K Sports said yesterday. As with any HD-3D product, you'll need both a television capable of displaying it and the special specs to see the effect. If you lack either, you can still play the 3D version of NBA 2K11 with normal visual presentation. This feature is for the PS3 only. 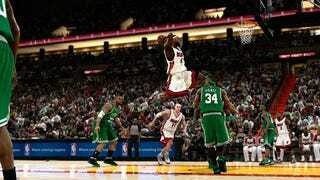 When its 3D version ships, NBA 2K11 will be one of the first to be playable in high-definition 3D with motion control. PlayStation Move is supported in all current versions of NBA 2K11.